We awoke and our hope was to drive on the Blue Ridge Parkway and stop for a nice hike. A short drive from our inn is where the Blue Ridge Parkway meets Skyline Drive. Who would have thought to call ahead? By now the roads are surely opened?…. 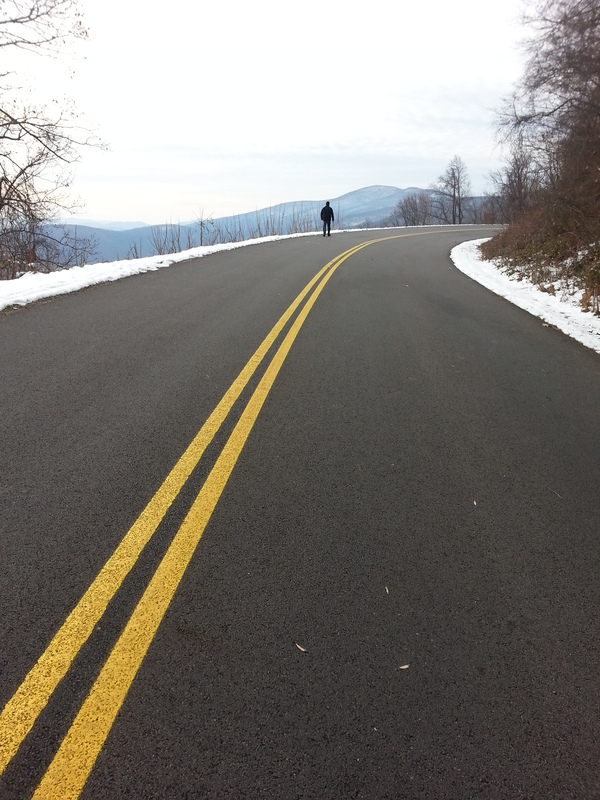 …We arrived to find the Parkway shutdown and the Skyline drive still closed due to the snow. Well what to do? Hike ON the parkway. We arrived before most others and enjoyed a solitary walk along the rode heading upward – There was something so serene but almost eerie of being the only ones on a road usually filled with drivers. The views were just amazing down to the valley below. There were indeed some patches were the ice formed on the roadway which I am sure would make it a treacherous drive. After our nice hike we stopped for some lunch and beer tasting at Devils Backbone. We had enjoyed the Vienna Lager and wanted to taste what else they offered. We had no idea what to expect. As we drove up we were surprised by a beautiful huge lodge-like building that looked straight out of Colorado and that was jam packed! We also visited Wild Wolf Brewing where we had expected nicer surrounding but found the shops all empty – however we ended up enjoying this beer far more and left with some very well priced bottles. So Devils offered the better atmosphere and Wild Wolf offered the better beer. We enjoyed another hike in the valley below and returned to Iris Inn for an evening wine tasting followed by a relaxing soak in the hot tub. This ended abruptly when our power went out. After regaining power, I unfortunately fell into a deep sleep in our treehouse above the woods and would sadly not awake again until it was time to say goodbye. We drove up to Bristol Vt for one last place to check out for we had read on Beer Advocate that it had great beer. We had no idea just how good the food was and that to get a table was reservation only! What a great little mountain town! I felt like I was back out West. 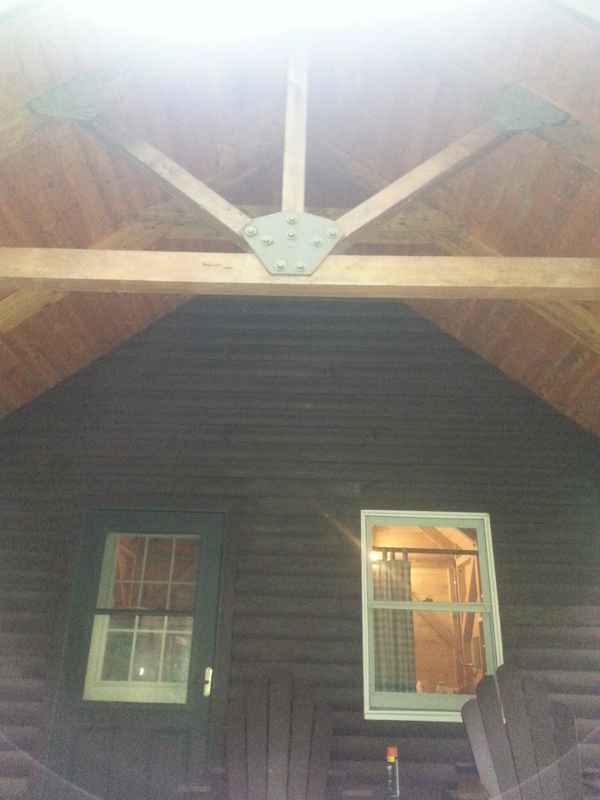 This would be a great base camp for a future trip to explore North Vermont Breweries. I even had the chance to meet a nice couple who were originally from my hometown state who owned a campground in the area. I started with Saison De Cassis – mixed into this great beer is Vermont Blackcurrants! It was delicious! And then finished my evening with a Unrepentant Stout. The chocolate and dark coffee definitely come out in this beer and it was perfect ending to a great day! Next Stop on Route 7: Otter Creek! I’ve been a long time fan of Wolaver’s Wildflower Wheat – for me the perfect summer session beer in the middle of a humid afternoon – and so seeing where it is produced was a must stop on our Brewery tour. The Otter Creek Brewing Company is a great brew pub serving all three of their beers with big windows where you can look out at all the shiny tanks producing beer. 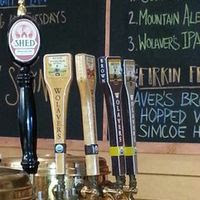 Although we are familiar with both Otter Creek and Wolaver’s we had not had The Shed, a small Vermont Brewery acquired by Otter Creek. The Shed Mountain Ale was good. Also tried the Wolaver’s Brown Ale and jumped ahead to the fall season and had a Wolaver’s Pumpkin. Sometime they even offer special test batch one day of the week (not the day we were there). Regardless – this is a great stop to enjoy a few beers low in ABV, have a nice chat with bartenders who know beer, and enjoy some good local food — but get there early. They shut down in the early evening so that the local bars get the spotlight and can make the money selling their beers. Amazing Falls! What a great place to visit on our Central Vermont brewery tour. Otter Creek runs straight through the center of town and you can walk over a great bridge to see it. You can then read about the history of the town on signs posted on the path that runs next to the falls. We had a small bite to eat for lunch at Two Brothers Tavern- a classic neighborhood pub serving good beer and food. I could see this being my local go to spot if I lived here! Also there is plenty of neat shops to visit after eating and before continuing the journey north on our brewery tour. This is my second trip to Middlebury – the first being many years ago. There are a lot of neat things to do in the area so this would be a great place to stay for a few days. Deliciousness!! Award for our most favorite beer on today’s brewery tour. 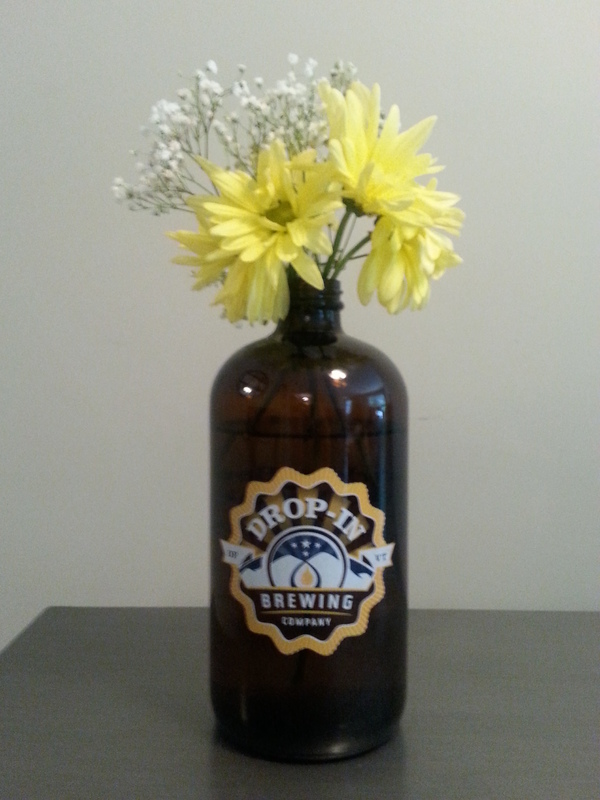 And most unobtainable… they do not bottle and so the only option to take with you is to get a growler to go. The Head Brewer’s main focus is teaching the craft of making beer. This would be a wonderful place to go if interested in learning to make your own beer – both beginner and advanced classes. You would certainly be learning from someone who really knows how to make good beer! Best Craft Beer in Bennington – Ramunto’s!